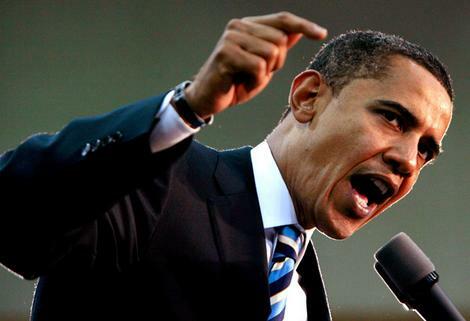 Obama claims that his administration and his tax policy is not class warfare against the rich. Taking a defiant tone against Republicans unwilling to raise taxes in order to close the deficit, President Obama today unveiled a $3 trillion long-term deficit reduction plan that relies heavily on raising taxes on the wealthiest Americans. The policies of his administration are not class warfare against the rich. They’re class warfare by the Obama administration, the establishment, and the military-industrial complex against everyone else. Let’s take his claim that “the money has to come from somewhere” — that’s correct. Paying down the debt requires that the money come from tax revenues. Americans commit almost 30% of their GDP to taxation. The reality here is that a majority of government spending is going toward permanent warfare, “global security“, the military industrial complex, guns, bombs and death. Beyond that, money spent is often frittered away on crony capitalism, bridges to nowhere, and Washington’s largesse. That is an epic transfer of wealth from ordinary Americans. But not only that it is significantly weakening America — every gun built, every bomb dropped, every phoney war created is money, time, effort and skills wasted that could instead have been spent on creating infrastructure, starting enterprises, investing in new equipment, building schools, developing technology, opening factories, or hiring workers. Alas, it is not only the permanent war that is transferring wealth from the poor to the rich — it is the drastic inflation of the money supply that occurs through the process of central banking, too. So the American people are struck with two hammer blows — the hammer of an ever-weakening currency diminishing their purchasing power and encouraging ceaseless consumption, and the hammer of an ever-greater military spending that strips wealth away from the working people, and hands it to defence contractors to build aircraft carriers, missiles, and tanks. And what’s Obama’s recipe to get America out of this mess? He wants to take more productive capital out of the economy so he can hand it to institutional investors, and authoritarian foreign regimes who bought U.S. bonds? Is this a joke? Why doesn’t he address the elephant in the room — the absurd military overspending — instead of taking yet more productive capital away from the American people. This entry was posted in Current Affairs, Economics for the Jilted Generation and tagged bimetallism, class warfare, elephant in the room, gold standard, inflation, military keynesianism, military overspending, military spending, money, obama, parasite, paul krugman, poor, raising taxes, rich, Ron Paul, transfer of wealth. Bookmark the permalink. ← Another Sign of Coming Blowup? 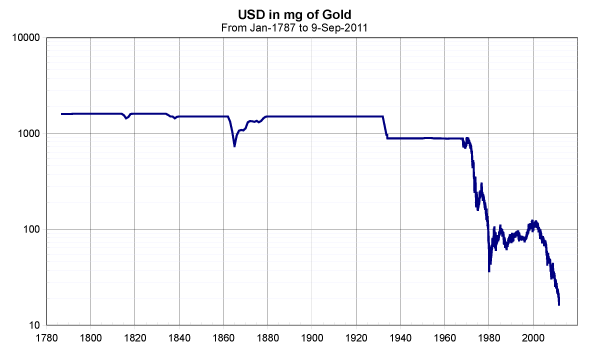 Two points – 1) please point out that the $ in Mg of Au is Log so it’s really so much worse than it looks. 2) Military spending is and has been Keynesian stimulus carried out by the Right. In that light, President Bush was perhaps the most Keynesian of Presidents in recent memory and he makes Obama look like a rank amateur on the spending front. Unfortunately I couldn’t understand this when I voted for him twice. I think we may be at the point where revolution is the only choice. Now if Ellen and the girls on the View will just call us to get up and do something about it… (I guess we are just doomed). Bush drastically increased military/Keynesian spending over Clinton. Obama sustained Bush’s spending levels (just as Krugman would tell him to — we can’t have a dip in aggregate demand now, can we?). So Bush had a rapid increase. But the so-called-anti-war hopey changey Obama isn’t just bad — he’s a hypocrite. Then again, I guess Bush is a hypocrite too for calling himself a fiscal conservative. At least bush didn’t pretend to care about the poor. You don’t remember compassionate conservatism? Everybody loves a free lunch, until they find out they paid for it!!! I recall when the 911 attack occurred and they said they were going to war. I said to a friend, this is the final straw for the USA. Like Rome 2000 years ago, they bankrupted the Treasury through war. Could you imagine that instead of Rome going on conquest, they created hubs of learning and commerce. They would have attracted the brightest minds in the world. They could have sent dignitaries to the far reaches of the planet, and offered assistance to the rulers. Instead they offered war. Look at the result. Decay and ruin. We are going to have a complete collapse of world banking and governments, and the solution will be Free Market Anarchy, Fascism or Communism. The air is ripe for revolutionaries to promise the world. I believe the Chinese model will spread around the world. It will be easy to offer a model to the public, based on perceived strength. I bet the rich are joining a “Communist Party” right now, so they can cement their power and privilege. If you start cutting military unemolyment will start to rise. It’s not like there are jobs for our service men to come back to. If you start cutting military you stop taking money out of the productive economy and give the money back to the people for them to spend it on what they want and need. For the cost of the Pentagon every soldier could be given $100,000 to start a business.